Victories in the inner game may provide no additions to the trophy case, but they bring valuable rewards which are more permanent and which can contribute significantly to one’s success, off the court as well as on. The player of the inner game comes to value the art of relaxed concentration above all other skills; he discovers a true basis for self-confidence; and he learns that the secret to winning any game lies in not trying too hard. the player of the inner game uncovers a will to win which unlocks all his energy and which is never discouraged by losing. All that is needed is to unlearn those habits which interfere with it and then to just let it happen. I was beginning to learn what all good pros and students of tennis must learn: that images are better than words, showing better than telling, too much instruction worse than none, and that trying often produces negative results. Athletes in most sports use similar phrases, and the best of them know that their peak performance never comes when they’re thinking about it. Perhaps a better way to describe the player who is “unconscious” is by saying that his mind is so concentrated, so focused, that it is still. It becomes one with what the body is doing, and the unconscious or automatic functions are working without interference from thoughts. The concentrated mind has no room for thinking how well the body is doing, much less of the how-to’s of the doing. When a player is in this state, there is little to interfere with the full expression of his potential to perform, learn and enjoy. The development of inner skills is required, but it is interesting to note that if, while learning tennis, you begin to learn how to focus your attention and how to trust in yourself, you have learned something far more valuable than how to hit a forceful backhand. The backhand can be used to advantage only on a tennis court, but the skill of mastering the art of effortless concentration is invaluable in whatever you set your mind to. Now we are ready for the first major postulate of the Inner Game: within each player the kind of relationship that exists between Self 1 and Self 2 is the prime factor in determining one’s ability to translate his knowledge of technique into effective action. In other words, the key to better tennis—or better anything—lies in improving the relationship between the conscious teller, Self 1, and the natural capabilities of Self 2. This is the nub of the problem: Self 1 does not trust Self 2, even though it embodies all the potential you have developed up to that moment and is far more competent to control the muscle system than Self 1. This overcomes “trying too hard.” All these skills are subsidiary to the master skill, without which nothing of value is ever achieved: the art of relaxed concentration. IT IS THE CONSTANT “THINKING” activity of Self 1, the ego-mind, which causes interference with the natural capabilities of Self 2. In short, “getting it together” requires slowing the mind. Quieting the mind means less thinking, calculating, judging, worrying, fearing, hoping, trying, regretting, controlling, jittering or distracting. The mind is still when it is totally here and now in perfect oneness with the action and the actor. It is the purpose of the Inner Game to increase the frequency and the duration of these moments, quieting the mind by degrees and realizing thereby a continual expansion of our capacity to learn and perform. The first skill to learn is the art of letting go the human inclination to judge ourselves and our performance as either good or bad. First the mind judges the event, then groups events, then identifies with the combined event and finally judges itself. Be clear about this: letting go of judgments does not mean ignoring errors. It simply means seeing events as they are and not adding anything to them. judgmental labels usually lead to emotional reactions and then to tightness, trying too hard, self-condemnation, etc. This process can be slowed by using descriptive but nonjudgmental words to describe the events you see. The rose is a rose from the time it is a seed to the time it dies. Within it, at all times, it contains its whole potential. It seems to be constantly in the process of change; yet at each state, at each moment, it is perfectly all right as it is. When the mind is free of any thought or judgment, it is still and acts like a mirror. Then and only then can we know things as they are. What I have tried to illustrate is that there is a natural learning process which operates within everyone—if it is allowed to. This process is waiting to be discovered by all those who do not know of its existence. There is no need to take my word for it; it can be discovered for yourself if it hasn’t been already. If it has been experienced, trust it. (This is the subject of chapter 4.) To discover this natural learning process, it is necessary to let go of the old process of correcting faults; that is, it is necessary to let go of judgment and see what happens. Will your strokes develop under the effect of noncritical attention or won’t they? Test this. By ending judgment, you do not avoid seeing what is. Ending judgment means you neither add nor subtract from the facts before your eyes. Things appear as they are—undistorted. In this way, the mind becomes more calm. THE FIRST INNER SKILL to be developed in the Inner Game is that of nonjudgmental awareness. When we “unlearn” judgment we discover, usually with some surprise, that we don’t need the motivation of a reformer to change our “bad” habits. We may simply need to be more aware. There is a more natural process of learning and performing waiting to be discovered. It is waiting to show what it can do when allowed to operate without interference from the conscious strivings of the judgmental self. Letting it happen is not making it happen. It is not trying hard. It is not controlling your shots. These are all the actions of Self 1, which takes things into its own hands because it mistrusts Self 2. Remember that you are not your tennis game. You are not your body. Trust the body to learn and to play, as you would trust another person to do a job, and in a short time it will perform beyond your expectations. Let the flower grow. To Self 2, a picture is worth a thousand words. It learns by watching the actions of others, as well as by performing actions itself. The other possibility is to learn to look up to Self 2. This is the attitude of respect based on true recognition of its natural intelligence and capabilities. Another word for this attitude is humility, a feeling that happens naturally in the presence of something or someone you admire. As you find your way to an attitude that slopes upward toward Self 2 with respect, the feelings and thoughts that accompany the controlling and critical attitude fade and the sincerity of Self 2 emerges. With an attitude of respect, you learn to speak in the language of the respected person. What is the native language of Self 2? Certainly not words! Words were not learned by Self 2 until several years after birth. No, the native tongue of Self 2 is imagery: sensory images. Movements are learned through visual and feeling images. It is often helpful for these players to shift their attention from means to ends. Getting the clearest possible image of your desired outcomes is a most useful method for communicating with Self 2, especially when playing a match. Self 1’ s only role is to be still and observe the results in a detached manner. “Asking for qualities” describes this other kind of role-playing. Besides being a lot of fun, this kind of role-playing can greatly increase a player’s range. The defensive player learns that he can hit winners; the aggressive one finds that he can also be stylish. I have found that when players break their habitual patterns, they can greatly extend the limits of their own style and explore subdued aspects of their personality. Letting go of judgments, the art of creating images and “letting it happen” are three of the basic skills involved in the Inner Game. To me it makes sense to build any system of instruction upon the best possible understanding of natural learning, the learning process you were born with. The less instruction interferes with the process of learning built into your very DNA, the more effective your progress is going to be. Said another way, the less fear and doubt are embedded in the instructional process, the easier it will be to take the natural steps of learning. One way to gain insight and trust in natural learning is to observe young children learning before they have been taught, or to observe animals in the act of teaching their young. I believe that it is most important to recognize that, fundamentally, experience precedes technical knowledge. In a society that has become so oriented toward language as a way of representing truth, it is very possible to lose touch with your ability to feel and with it your ability to “remember” the shots themselves. I believe this remembering is a fundamental act of trust in Self 2 without which excellence in any skill cannot be sustained. In short, if we let ourselves lose touch with our ability to feel our actions, by relying too heavily on instructions, we can seriously compromise our access to our natural learning processes and our potential to perform. Instead, if we hit the ball relying on the instincts of Self 2, we reinforce the simplest neural pathway to the optimal shot. So the question that remains is how one person’s greater level of experience can help another person. The short answer is that a valid instruction derived from experience can help me if it guides me to my own experiential discovery of any given stroke possibility. Natural learning is and always will be from the inside out, not vice versa. You are the learner and it is your individual, internal learning process that ultimately governs your learning. When one learns how to change a habit, it is a relatively simple matter to learn which ones to change. Once you learn how to learn, you have only to discover what is worth learning. It is as if the nervous system were like a record disk. Every time an action is performed, a slight impression is made in the microscopic cells of the brain, just as a leaf blowing over a fine-grained beach of sand will leave its faint trace. When the same action is repeated, the groove is made slightly deeper. After many similar actions there is a more recognizable groove into which the needle of behavior seems to fall automatically. Then the behavior can be termed grooved. In short, there is no need to fight old habits. Start new ones. It is the resisting of an old habit that puts you in that trench. Starting a new pattern is easy when done with childlike disregard for imagined difficulties. You can prove this to yourself by your own experience. The process is an incredibly simple one. The important thing is to experience it. Don’t intellectualize it. See what it feels like to ask yourself to do something and let it happen without any conscious trying. For most people it is a surprising experience, and the results speak for themselves. This method of learning can be practiced in most endeavors on or off the court. The more you let yourself perform free of control on the tennis court, the more confidence you tend to gain in the beautiful mechanism that is the human body. The more you trust it, the more capable it seems to become. When you try hard to hit the ball correctly, and it goes well, you get a certain kind of ego satisfaction. You feel that you are in control, that you are master of the situation. But when you simply allow the serve to serve itself, it doesn’t seem as if you deserve the credit. It doesn’t feel as if it were you who hit the ball. You tend to feel good about the ability of your body, and possibly even amazed by the results, but the credit and sense of personal accomplishment are replaced by another kind of satisfaction. If a person is out on the court mainly to satisfy the desires and doubts of ego, it is likely that in spite of the lesser results, he will choose to let Self 1 play the major role. I have found that the most effective way to deepen concentration through sight is to focus on something subtle, not easily perceived. It’s easy to see the ball, but not so easy to notice the exact pattern made by its seams as it spins. The instructions I gave students were very simple. “Say the word bounce out loud the instant you see the ball hit the court and the word hit the instant the ball makes contact with the racket—either racket.” Saying the words out loud gave both me and the student the chance to hear whether the words were simultaneous with the events of bounce and hit. It is this rhythm, both seen and heard, which holds fascination for my mind and enables it to focus for longer periods of time without becoming distracted. It rarely occurs to a player to listen to the ball, but I have found great value in this focus. Few players understand the importance of concentrating attention on the feel of the racket as they are holding it. There are two things that a player must know on every shot: where the ball is and where his racket is. It would be useful for all tennis players to undergo some “sensitivity training” with their bodies. The easiest way to get such training is simply to focus your attention on your body during practice. Ideally, someone should throw balls to you, or hit them so that they bounce in approximately the same spot each time. Then, paying relatively little attention to the ball, you can experience what it feels like to hit balls the way you hit them. Though focus of attention helps your tennis, it is equally true that playing tennis can help your focus of attention. Attention is focused consciousness, and consciousness is that power of knowing. But it is also necessary to learn to focus awareness in the now. This simply means tuning in to what is happening in the present. The greatest lapses in concentration come when we allow our minds to project what is about to happen or to dwell on what has already happened. the conscious energy you need to perform at your peak in the now has been leaking into an imagined future. All who enter even a little into that state of being present will experience a calmness and a degree of ecstasy which they will want to repeat. Alertness is a measure of how many nows you are alert to in a given period. The result is simple: you become more aware of what is going on as you learn to keep your attention in the now. In a match it is usually best to pick one focus—whatever works best for you—and stick with it. The critical time is between points! After the last shot of a rally, the mind leaves its focus on the ball and is free to wander. It is at this moment that thoughts about the score, your erratic backhand, business, the children, dinner and so forth tend to siphon your energy away from the here and now. Then it is difficult to regain the same level of concentration before the next point begins. when we focus on breathing we are putting our attention on something closely connected to the life energy of the body. Also, breathing is a very basic rhythm. One caution about “the zone”: it cannot be controlled by Self 1. I have seen many articles that claim to provide a technique for “playing in the zone every time.” Forget it! This is a setup. It’s an age-old trap. Self 1 likes the idea of playing in the zone, especially the results that usually occur. So Self 1 will try to grasp onto almost anything that promises to take you to what everyone agrees is a wonderful place. But there is one catch; the only way to get there is to leave Self 1 behind. So as long as you let Self 1 be the one that takes you there, it will be there too and you will not be able to go into the zone. If you do, even for a moment, Self 1 will say, “Good, I got there,” and you will be out again. Another way to look at the zone is that it comes as a gift. It is not a gift you can demand of yourself, but one you can ask for. How do you ask? By making your effort? What is your effort? Your effort depends on your understanding. But I would say it always involves an effort to focus and an effort to let go of Self 1 control. As trust increases, Self 1 quiets, Self 2 becomes more conscious and more present, enjoyment increases and the gifts are being given. If you are willing to give credit where credit is due and not think you “know” how to do it, the gifts are apt to be more frequent and sustainable. I used to think that whatever was present in that state would leave me, was ephemeral. Now I know that it is always there and it is only I who leave. When I look at a young child I realize it is there all the time. As the child grows, there is more to distract the mind, and it is harder to recognize. But it, Self 2, may be the only thing which has been there and will be there your entire life. Thoughts and thinking come and go, but the child self, the true self, is there and will be there as long as our breath is. To enjoy it, to appreciate it, is the gift of focus. It’s difficult to have fun or to achieve concentration when your ego is engaged in what it thinks is a life-and-death struggle. Self 2 will never be allowed to express spontaneity and excellence when Self 1 is playing some heavy ulterior game involving its self-image. Yet as one recognizes the games of Self 1, a degree of freedom can be achieved. When it is, you can discriminate objectively and discover for yourself the game you think is really worth playing. Staying in the tournament another round or two didn’t seem overwhelmingly attractive, so I asked myself a final question: “Then what do you really want?” The answer was quite unexpected. What I really wanted, I realized, was to overcome the nervousness that was preventing me from playing my best and enjoying myself. I wanted to overcome the inner obstacle that had plagued me for so much of my life. I wanted to win the inner game. Children who have been taught to measure themselves in this way often become adults driven by a compulsion to succeed which overshadows all else. The tragedy of this belief is not that they will fail to find the success they seek, but that they will not discover the love or even the self-respect they were led to believe will come with it. Why does the surfer wait for the big wave? The answer was simple, and it unraveled the confusion that surrounds the true nature of competition. The surfer waits for the big wave because he values the challenge it presents. He values the obstacles the wave puts between him and his goal of riding the wave to the beach. Why? Because it is those very obstacles, the size and churning power of the wave, which draw from the surfer his greatest effort. It is only against the big waves that he is required to use all his skill, all his courage and concentration to overcome; only then can he realize the true limits of his capacities. Some great zen principles as it applies to tennis – being present, letting go and having fun, being mindful and aware and other skills which are vital in the path to mastery in any arena. Using imagery, being aware of your thoughts, feelings, emotions, body, focus and more we’re also some key concepts discussed. 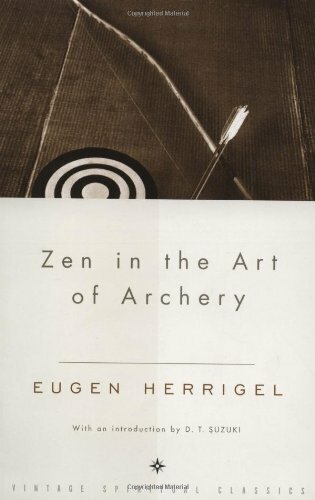 A good complement to this book is Herrigel’s Zen in the Art of Archery as many of these same topics are discussed but in relation to archery. As one achieves focus, the mind quiets. As the mind is kept in the present, it becomes calm. Focus means keeping the mind now and here. Relaxed concentration is the supreme art because no art can be achieved without it, while with it, much can be achieved. One cannot reach the limit of one’s potential in tennis or any endeavor without learning it; what is even more compelling is that tennis can be a marvelous medium through which skill in focus of mind can be developed. By learning to focus while playing tennis, one develops a skill that can heighten performance in every other aspect of life. Not assuming you already know is a powerful principle of focus. How to stay concentrated in the here and now between points? My own device, and one that has been effective for many of my students, is to focus attention on breathing. Some object or activity which is always present is needed. But who said that I am to be measured by how well I do things? In fact, who said that I should be measured at all? Who indeed? What is required to disengage oneself from this trap is a clear knowledge that the value of a human being cannot be measured by performance—or by any other arbitrary measurement. This entry was posted in Books and tagged Mastery, Psychology, Tennis, Tom Gallwey, Zen on May 27, 2017 by Blas.